Folks like using British Airways Avios points to book award flights on British Airways and their partner airlines, because their distance based award chart is great for short-haul flights. And for inexpensive award flights from the West Coast to Hawaii. Or from certain US cities to Europe! 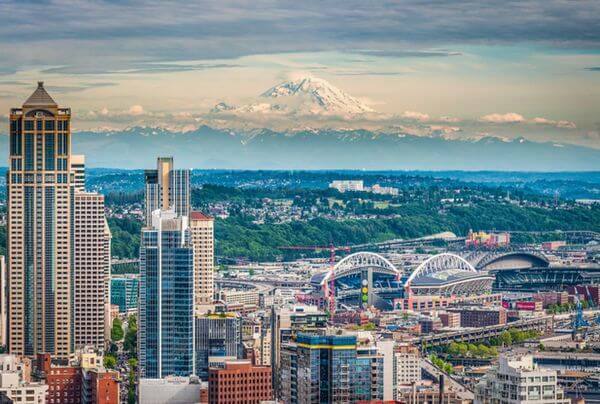 7,500 British Airways Avios Points Is Enough for a One-Way Partner Award Flight to Seattle From Cities Like Los Angeles, Portland, and Phoenix! Because of the increased up to 100,000-point sign-up bonus on the Chase British Airways Visa Signature Card, now is a great time to consider applying for it! And if you’re looking for other ways to earn British Airways Avios points, you can transfer flexible points from Starwood, Chase Ultimate Rewards, and AMEX Membership Rewards points to British Airways, too. 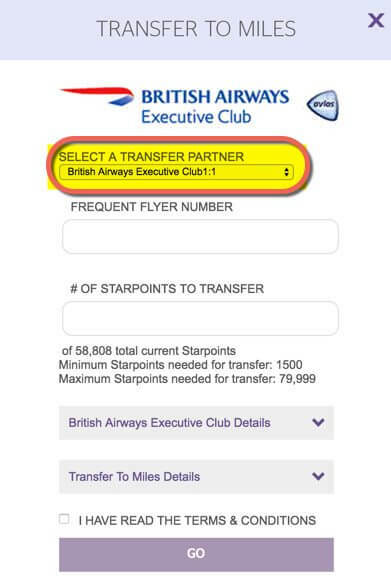 In this part of the series, I’ll show how to transfer Starwood points to British Airways Avios points. You can transfer Starwood points to British Airways at a 1:1 ratio. Unfortunately, there aren’t many ways to earn Starwood points, which is one of the reasons why they are valuable. You’ll also get a 5,000 British Airways Avios point bonus for every 20,000 Starwood points you transfer. And although transfers can take up to 2 to 4 weeks, in my experience, it generally takes 2 to 10 days. Only transfer the points you need. 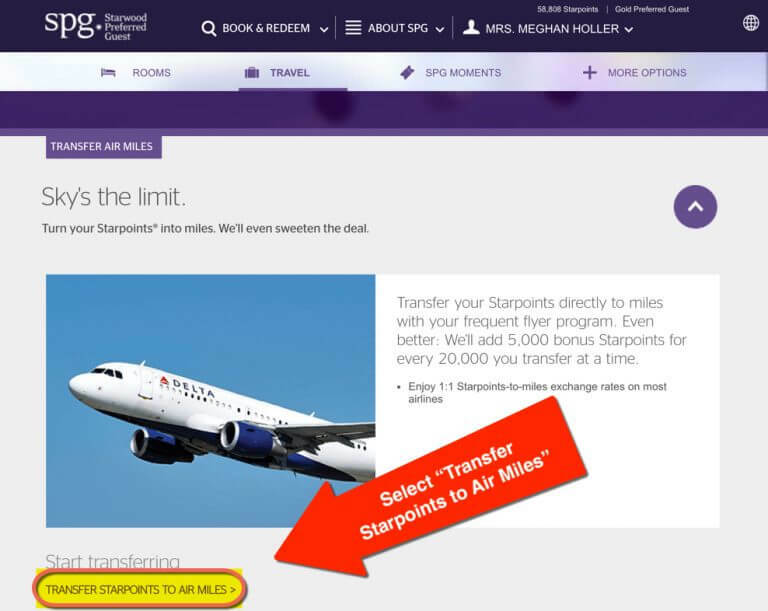 Because once transferred, you can NOT put the points back into your Starwood account. And there are a minimum number of points you’ll need to transfer depending on your elite status with Starwood. If you have Starwood Platinum status there’s no minimum point transfer requirement. Starwood Gold members must transfer at least 1,500 Starwood points. And everyone else must transfer a minimum of 2,500 Starwood points. From Starwood’s homepage, enter your log-in information, including your username or Starwood loyalty number and password. Then click the “Sign In” button. After logging-in, click “About SPG” at the top of the page and select “Flights & Travel” from the drop-down menu. The “Transfer Air Miles” Option Is Located Mid-Way Down the Page! From there, select British Airways as the transfer partner and enter your British Airways frequent flyer number. Then enter the number of Starwood points you want to transfer and click the “Go” button! The terms say transfers can take up to 4 weeks. But in my experience it only takes between 2 and 10 days. 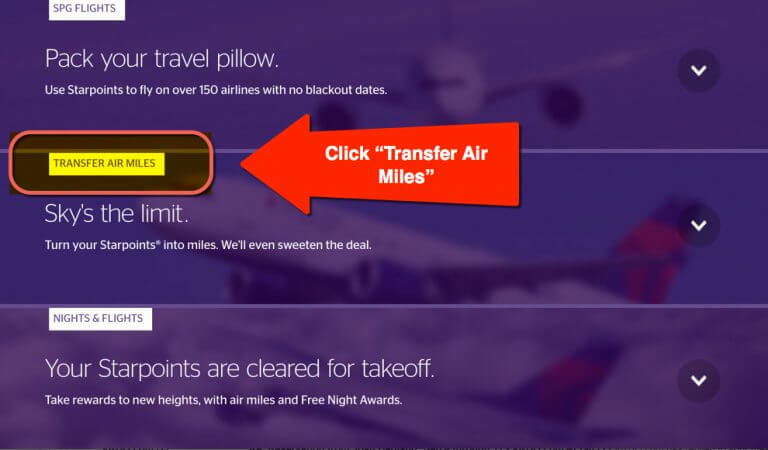 Just remember, once you transfer Starwood points (to any airline! ), you will NOT be able to get them back. So be sure to transfer only the points you need. And don’t forget to check out my series on booking British Airways award flights like a pro. If you have the Chase Freedom, Chase Freedom Unlimited, or Chase Ink Business Cash Credit Card, you can combine points with one of the cards listed above to transfer to British Airways. For more details, check out my post on how to transfer Chase Ultimate Rewards points to British Airways. For more details, check out my post on how to transfer AMEX Membership Rewards points to British Airways. The Chase British Airways card is a great option for folks looking to earn more British Airways Avios points. But you can also transfer Starwood points to British Airways at a 1:1 ratio. And get a 5,000-point bonus for every 20,000 Starwood points you transfer! The best way to earn Starwood points is through spending at Starwood (or Marriott!) hotels. And with credit cards like the personal or small business AMEX Starwood cards. 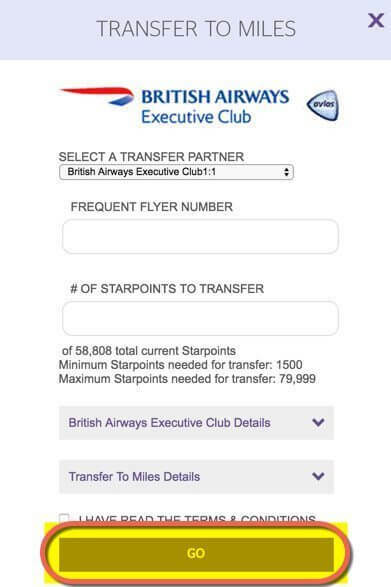 Then, it’s easy to move Starwood points to British Airways after signing-in to your Starwood account. Although transfers can take up to 4 weeks, they usually post within 2 to 10 days. Do you have a favorite way to use British Airways Avios points? By transfering the SPG pts to Marriott and using them to buy packages, each SPG pt has a marginal value of 3 Avios. I’m also still sore at Chase over how they cheated me out of last 25k of my Chase/BA card last year…. Folks here who sign up for the Chase / BA card need to get it in WRITING from the day you get your card to find out exactly when your first year is up. If you don’t ask, they won’t tell you. (and it won’t be the day you activate the card, or when it was mailed to you — but rather a mystery date they keep internally, on when they think they activated your account — in my case, there was ten days difference….. and I got burned badly a year later when I was so proud of myself for finishing up spending under a year from when I activated the card…. but nope, senior management at Chase over-rode sympathetic lower level reps (who thought by complaint was legit) and refused to budge…. Sounds like a great way to build up Avios, but how do you replenish Starpoints, which is my favorite for hotels? Once in your BA Avios account, for short haul flights, there’s wisdom in transferring to Iberia Avios account–the same short haul flights require fewer Avios.